In recent months, an interesting debate has developed around whether the coronal approach for forehead recontouring increases forehead length. 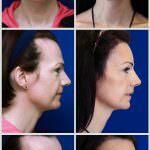 Patients ask us why we do not use a direct approach for hairline lowering. There are several arguments behind our decision to avoid hairline approaches whenever possible. Thank you for your interest in our blog. Topics such as this are a stimulus for discussion, which often leads to professional development and the global improvement of services. Our medical team voluntarily attends to growing enquiries with the aim to offer greater clarity on current subjects of debate. Let us know what new topics interest you. 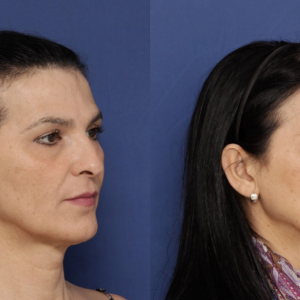 The three basic pillars of the FACIALTEAM working philosophy are: natural results, maintaining the identity of each patient, and avoiding visible scars. The disadvantages inherent in hairline approaches include the potential risk of leaving a scar in a visible area, the risk of poor scarring (hypertrophic scarring) due to the high tension associated with this region, a very unnatural hairline without natural unevenness (the hairline is always asymmetrical and uneven), and less control over eyebrow position during the forehead repositioning (since it is not possible to use a reliable anchoring system). Moreover, the hairline form should not be modified using this type of approach, since this would result in quite extensive scarred areas, usually under tension. If hairline modification is necessary (for example, due to a receding hairline), a deferred hair transplant can be done. In no case do we recommend a hairline incision together with a simultaneous hair transplant, due to the high degree of risk to the new transplanted follicles, whose vascularization may be compromised given their position very close to the incision. Surgical lowering of the hairline may be indicated for patients with a high, rounded hairline with no receding (Type III). This hairline type is found in around 4% of the male-to-female (MtF) transgender population. It is widely believed that the male forehead is longer than the female forehead. This is chiefly due to the fact that a receding hairline increases the perceptible forehead surface area, giving rise to the optical effect that produces this confusion. 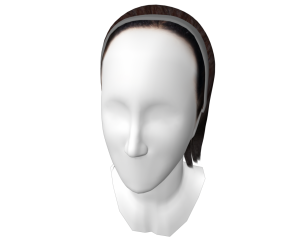 Actually, the ideal female forehead is longer than the male forehead, particularly in the central area. Academically and objectively, the ideal face can be divided into three parts of equal dimensions that provide a harmonic balance. The upper third encompasses the region between the trichion (forehead beginning from the hairline) and the glabella (the most prominent area between the eyebrows). Subjectively, the height of the forehead is determined by the position of the eyebrows and beginning of the hairline. 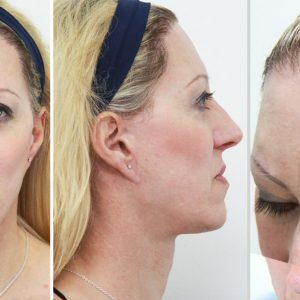 Our forehead recontouring technique using a coronal approach eliminates the volume of surplus bone, leaving some excess skin. For that reason, it is necessary to excise a strip of skin (scalp) to compensate and ensure that no sagging tissues are left. However, the width of the removed strip is not transferred to the raising of the hairline. In other words, despite removing a strip approximately 1.5 cm wide, the hairline will only be raised very subtly, from 1 to 3 mm. This is because of the scalp’s extraordinary capacity to stretch and bend. Moreover, eliminating this strip of scalp prevents the accumulation of blood and post-surgical hematomas. Finally, this strip is an excellent hair follicle donor site for those patients who are candidates for a simultaneous hair transplant (SHT). Additionally, to prevent the soft tissues from sagging, and reposition them to the new bone contour naturally, resorbable anchoring devices are used as guides. 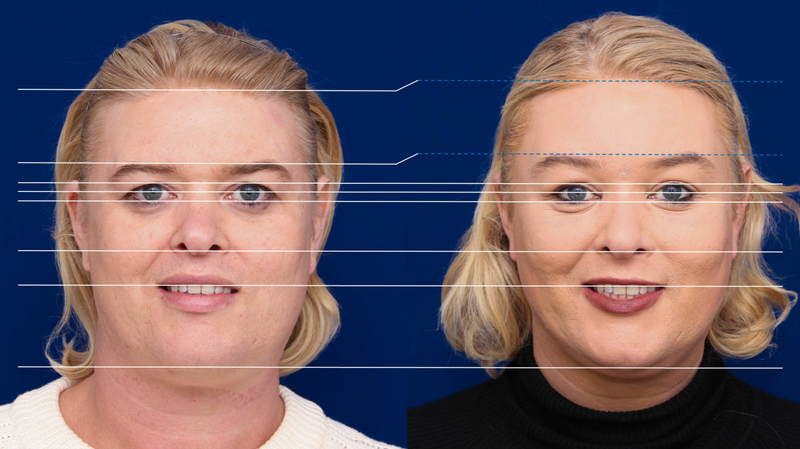 With these systems, it is possible to control the symmetry of the eyebrow repositioning while simultaneously achieving a discreet “lifting effect”. Raising the eyebrow position in this way maintains the relative distance between the eyebrows and the hairline (see Figure 5). One dimension that does increase is the distance between the upper eyelid margin and the eyebrow, which further opens the eyes, producing a “fresher” look. 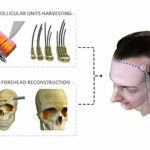 If the patient’s forehead size must be decreased, the lowering is done with a hair transplant. Fig. 5 The distance between the eyebrows and beginning of the hairline is maintained after reshaping the forehead using a coronal approach. However, the distance between the upper eyelid margin and eyebrow is discreetly increased. We are available to answer any question you may still have or that may have arisen after reading the text.